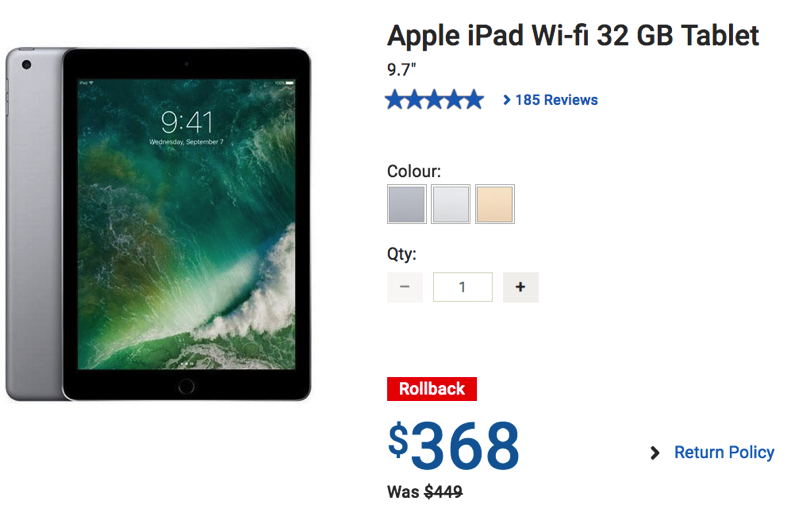 Walmart has Apple’s 9.7-inch iPad 32GB on sale, available for $368, which works out to an 18% discount and savings of $81 off the regular price of $449. This model is available in Silver, Gold and Space Grey. During last Christmas, Walmart had this iPad on sale for slightly cheaper at $348, but this discount is still decent. Also, the advertised price is lower than what it would cost for a refurbished model from Apple.ca at $379, so this is a bonus. This 9.7-inch iPad was released back in March 2017 and is powered by an A9 chip and comes with 10 hours of battery life. Best Buy currently sells this model for $449, so you could price match and save a bit more.